The Genealogy Division at the Indiana State Library has a small but expanding Manuscript collection within our holdings. One of the collections we have in our possession is the John T. Waters collection consisting of two funeral books from his business that date from 1900 to 1913. Some funerals were more elaborate mainly due to the cost of the casket. Ms. Schultz’s family not only paid to have her embalmed they also paid for a few extras such as a copper plate lining for her casket and flowers. John T Waters and his father Isaac had a funeral and undertaking business in the Pittsboro area of Hendricks County in the late 19th to early 20th century. The funeral books from that business are a great resource for a researcher with family from the area. The books contain the date, place, and cause of death, age, attending physician, and place of burial. Some of the records also include parents’ names and birthplaces, when and where the funeral was held and if there was clergy present. The funerals costs for a child were considerably less. Also note cause of death in this instance is unknown. 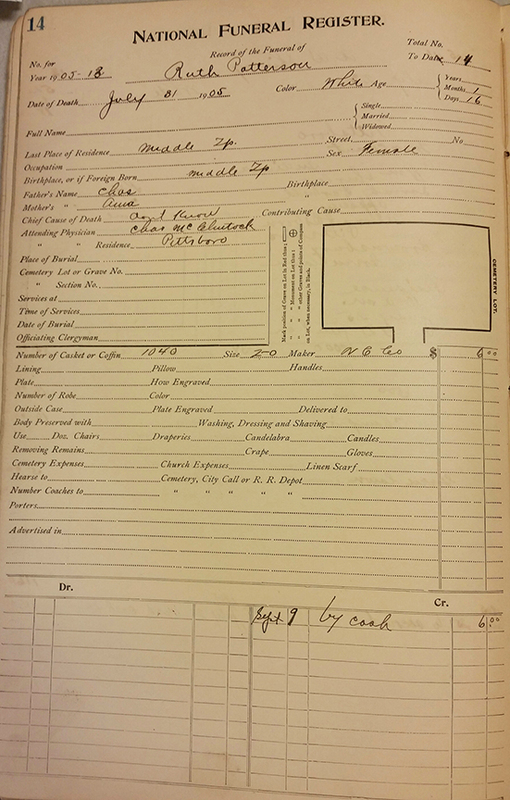 The funeral books records also contain information about the extravagance and cost of each person’s funeral. 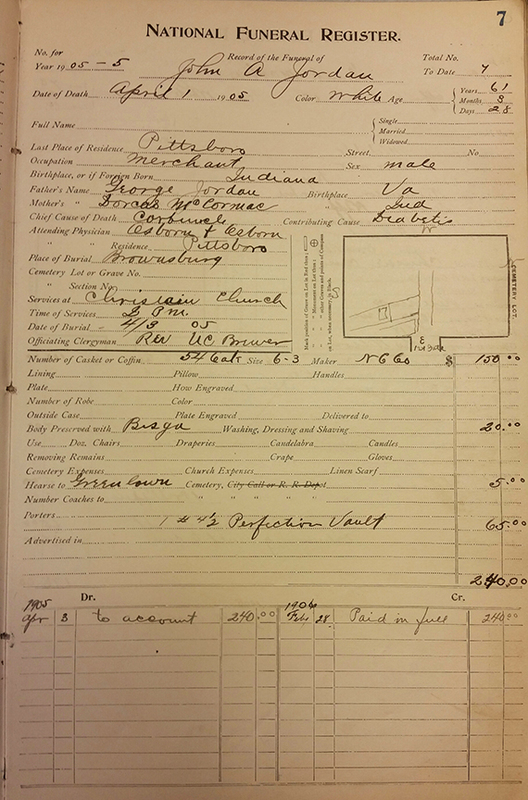 Coffin type and size, preparations, and other expenses dominate the lower portion of the page. The cost ranged from a low of $18.00 for a very simple coffin to over $200 for a more ornate funeral. A few of the funeral entries contain sketches of where the deceased was buried, which can be helpful if a cemetery was not maintained. While deaths in Indiana were recorded by the counties starting in 1882 full compliance was not reached until the 1920’s. These funeral books help bridge the gap of missing information and may be the only record of someone’s death. In addition to our collection researchers may want to explore related holdings held in the rare Books and Manuscript division. 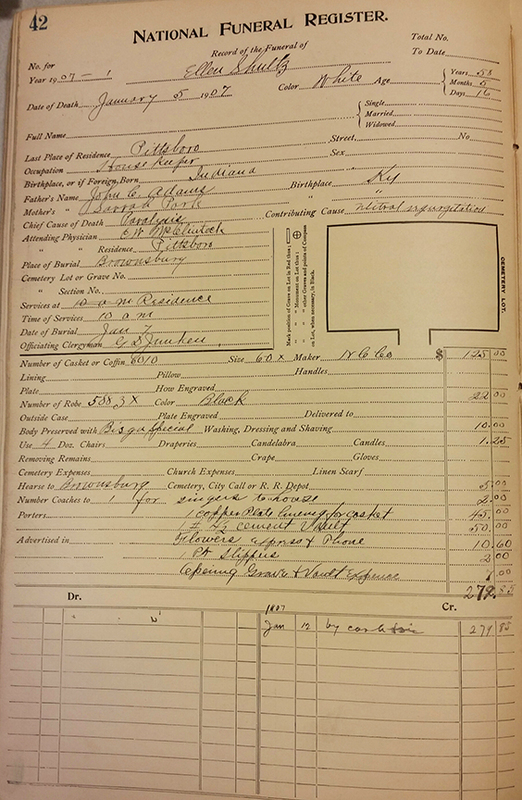 They have the account books, business papers and correspondence from Isaac and John T. Waters funeral and furniture businesses for the years 1875-1891.